In 1965 #1080 Bend-leg Midge, better known as the American Girl Midge was released. 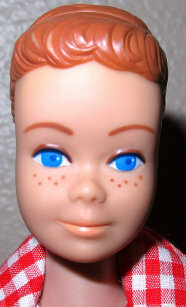 She had blue eyes, coral lips, and bendable legs. She came with either blonde, brownette, or titian hair colors. 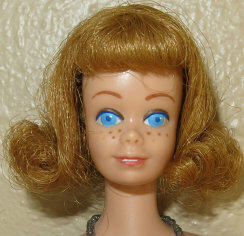 She is marked: ©1958 Mattel, Inc.
U.S. Patented U.S. Pat.Pend Made In Japan. Along with the doll in the box was Turquoise One Piece Striped Swimsuit, Blue Ribbon Headband, Turquoise Open Toe Heels, Wire Stand, and Booklet. 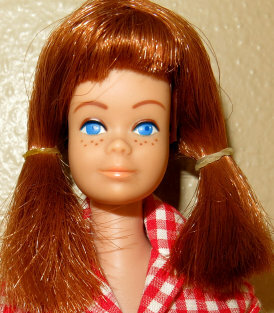 There were several variations of the Midge doll from 1963 to 1967. The most common, the #860 Straight-leg flip style hairdo Midge with freckles. She has blue eyes and coral lips. She came in brunette, blonde and titian hair colors. She can also be found in two rare variations, the no freckles Midge and with Midge with her teeth showing. She is marked: Midge T.M. ©1962 Barbie® ©1958 by Mattel, Inc. (In 1964 added the word Patented"). In the box Included the doll two-piece swim-suit, white open-toe heels, black wire stand, booklet. Note: Their swimsuit was based on her hair color. The suits were: Blonde hair had light blue top, darker blue bottoms. Brunette hair had pink top, red bottoms. Titian hair had yellow top, orange bottoms. 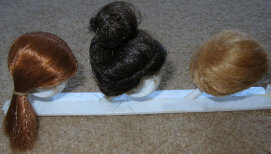 In 1965 #1009 Midge's fashion Model Wig Wardrobe (known as molded-head Midge) was released and came only with a head (no body) and 3 wigs (Titian double pony-tail, Blonde Swirl 'n Curl, and Brunette Topknot Pouf) along with a wig stand. She wore an orange headband. This set was not shown in the bookets, only in the Mattel catalogue.